When people pronate, they’re often told to strengthen the foot muscles to “build an arch” that sets the foot in a neutral position. However, this assumes that pronation is the same as flat feet, which it is NOT. If you haven’t already, check out our previous pronation posts to get up to speed! Remember, the issue with pronation is not with the arch, but with forefoot varus when the ankle is in subtalar neutral and the ball of the foot coming down to the ground when weight bearing. Therefore, training the muscles to create an arch helps minimally, as someone with forefoot varus will still pronate when the ball of the foot comes down. Even if the foot muscles can build an arch approximating subtalar neutral and are trained, they cannot maintain it 24-7: muscles eventually fatigue, causing the foot to pronate and the arch to collapse again—when dynamic movement is incorporated, that arch is even more likely to be lost. So what corrects for pronation? The answer is orthotics: custom insoles made to keep the foot in a subtalar neutral position. This is achieved by supporting both the arch and the ball of the foot, such that it no longer drops when weight bearing—something that cannot be compensated for with foot musculature OR an arch support alone (pronation is a structural issue). Many orthoses are actually just arch supports, but these don’t help much and may actually make the problem worse! Without support underneath the ball of the foot to maintain the forefoot varus position, pronation still occurs when weight bearing: the foot rolls over the arch support, which can further exacerbate one’s problems. Imagine shoving a rock underneath your foot and walking on it all day! As seen in the photo, a pronated foot  still pronates on an orthotic that’s just arch support  because the ball of the foot is unsupported. However, with the properly made orthotics , the ball of the foot is supported so the foot no longer pronates and can maintain a subtalar neutral position. That said, there are some (rare) cases of calcaneal or midfoot instability (WITHOUT forefoot varus) that do benefit from arch supports alone. It all depends on the foot structure! When the foot pronates and knee is rotated internally, any movement that requires flexion (bending) will occur at an oblique angle, as seen in the video above (the pronated foot is shown on the left, while the corrected foot is shown on the right). In other words, the knee does not move directly over the ankle, but rather off to the medial side (towards the midline of the body). Due to this oblique angle, people who pronate tend to excessively torque the knee—the degree of which depends on the degree of pronation. This puts additional strain on the anterior (front) and medial aspects of the knee, which may not be a significant issue when it comes to everyday activities such as walking, but it plays a huge factor in exercise and athletic performance. Due to the additional torque on the knee caused by pronation, athletes in sports that involve explosive, rotational, and lateral movements—on top of rapid changes in direction—may be more prone to injuries. Since some individuals (particularly the young and/or fit crowd) may be able to compensate for their pronation, not necessarily everyone who pronates will experience symptoms of pain. However, regardless of injuries and/or pain, pronation can certainly affect athletic performance. Having a “corrected” foot placed as close to subtalar neutral allows the knee and ankle to track properly, which translates to the optimal movement mechanics, as no energy is wasted in generating power. This significantly affects athletic performance, even in absence of injuries. When the knee doesn’t tract properly, more force is required to generate the same power and control the movement. This further exacerbates any issues caused by one’s pronation and can contribute to hip and knee stability. When the ankle and knee are properly aligned, the body is able to properly stabilize these structures and move more efficiently. In our first post regarding pronation, we discussed how pronation affects static posture. Today we’ll discuss how pronation affects dynamic movement, particularly the lower extremities. As the foot pronates and the midfoot rotates medially (inward), the knee also rotates internally. This alone may not seem like a big deal when dealing strictly with posture, but the real damage is occurs during movement. When people pronate they tend to stand with their feet pointed outwards due to their internally rotated knees. In order to stand in a way that takes stress off the knees, the feet must point outward: if the feet are parallel, the knees will be at an oblique angle towards the midline, which is uncomfortable for most people. Therefore, to keep the knees pointing straight forward, the toes must turn out. As a result, people who pronate tend to roll around the ball of the foot instead of rolling through it when they walk. As seen in the video, the pronated foot begins to roll inward (during the mid-stance phase of the gait cycle) before the heel leaves the ground, whereas the corrected foot remains stable. As the foot remains stable at the ankle and midfoot, it can then move through the ball of the foot instead of rolling around it (during the heel-off phase of the gait cycle). 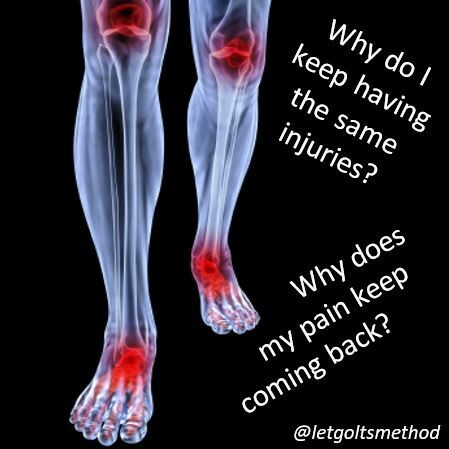 Due to this change in gait a person can develop any combination of the following issues: bunions, plantar fasciitis, neuromas, Achilles tendonitis, lateral ankle pain, knee pain, IT band or piriformis syndrome, low back or neck pain and poor posture and balance. In our previous post, we discussed what subtalar neutral and forefoot varus are and how they play a key role in determining whether someone pronates—go check it out if you haven’t seen it yet! This post will elaborate on that and focus on the difference between pronation and flat feet. In the previous post, there is a visible (albeit relatively low) arch when the foot is placed in subtalar neutral. However, that arch disappears when the ball of the foot comes down to the ground and the foot relaxes. Similarly, one could have an arch when the foot is non-weight bearing but becomes flat when weight bearing. In the video below, the foot has a visible arch when lifted off the ground, but again, disappears as soon as it’s lowered and the ball of the foot comes down. Notice how in both anterior and medial views, the lateral (outer) side of the foot hits the ground first—this is indicative of forefoot varus! Looking at the arch in non-weight bearing positions and weight bearing positions can sometimes offer some insight as to whether you pronate or truly have flat feet. If you have an arch (regardless of how high or low it is) when non-weight bearing but your foot flattens out when weight bearing, then you pronate. And if your foot is flat in both scenarios, then you truly have flat feet. However, the only way to truly tell whether you pronate or flat feet is to put the ankle in subtalar neutral and assess whether there is forefoot varus. For example, if the ankle is in subtalar neutral and an arch (regardless of height) forms but the person has forefoot varus, then they do not have actually flat feet—they simply pronate. However, if the foot does not exhibit forefoot varus in subtalar neutral and does not create an arch, then the person doesn’t pronated and truly does have flat feet. Since the position of the feet in subtalar neutral determines the degree of pronation, the arch collapsing is not the real reason why people pronate. It’s simply an effect due to forefoot varus and therefore, an arch support is not the key to fixing your pronation issues! Pronation and flat feet are often confused because many pronators have collapsed arches when weight bearing. In other words, when people stand and pronate, their arches often flatten out, which can be misinterpreted as “flat feet.” Before we discuss the difference between the two, we must first discuss the subtalar neutral position of the ankle, and forefoot varus. When a foot is placed in subtalar neutral, the axis of the tibia, talus, and calcaneus are in line and perpendicular to the ground. In this position, the ankle is neither pronated nor supinated. Once the foot is placed in subtalar neutral, the person’s inherent anatomical structure of the bones determines where the rest of the foot falls. More often than not, when patients are placed in subtalar neutral, the ball of the foot is elevated off the ground (forefoot varus*), as seen in the video. Once that happens, in order to stand and bear weight, the ball of the foot must come down. This is the reason why most people pronate! When the ball of the foot comes down, pronation occurs as the midfoot rotates medially (inward). 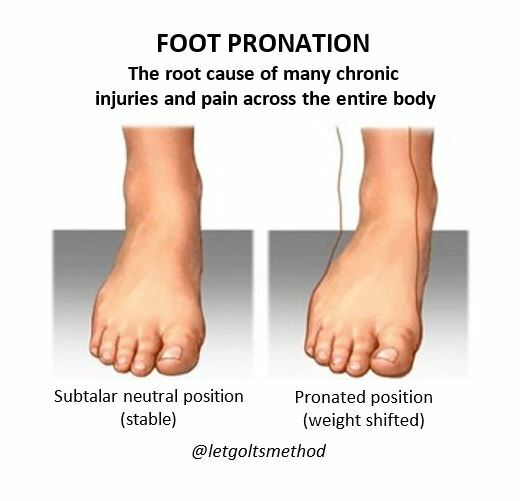 Since the degree of pronation is based on how far the ball of the foot comes off the ground when the ankle is put in subtalar neutral (i.e., how far the ball of the foot must come down to reach the ground), people with varying arch heights can still pronate. On the other hand, someone could have anything between high or low arches but not pronate at all. It all depends on where the rest of the foot falls after the ankle is placed into a subtalar neutral position. *Forefoot varus is an angled position of the bones in the forefoot when compared to the heel, where the bones on the inside of the forefoot rest higher than those on an outside, resulting in an oblique angle. Pronation is not the same as flat feet! It all depends on where your foot naturally positions itself once subtalar neutral is achieved. Up till now, our posts have addressed stiff upper backs, tight muscles, and certain postures that can contribute to chronic neck and/or low back pain. However, what we haven’t addressed is WHY the thoracic spine gets stiff and WHY those muscles get tight. More specifically, what causes them to end up that way and what causes your body to end up in the same position time and time again. Pronating also often comes with a flattening of the arches, which shouldn’t be confused with flat feet (to be covered later on). As the foot pronates, the knee rotates internally, (represented in the video links below). When this happens on both sides of the body, the hips will drop into anterior pelvic tilt. Once that happens, the body’s weight will begin to shift forward. In order to keep ourselves from falling forward, the lower back will extend backwards to maintain the center of gravity. In order to keep the center of gravity in line with the hips, the thoracic spine becomes curved while the shoulders round out. More often than not, the head will also be shifted slightly forward (“turtleneck” position). Here you can see how the body’s posture is affected by pronated feet vs feet set in subtalar neutral. The posture caused by pronation worsens over time as joints become stiffer and muscles become tighter. 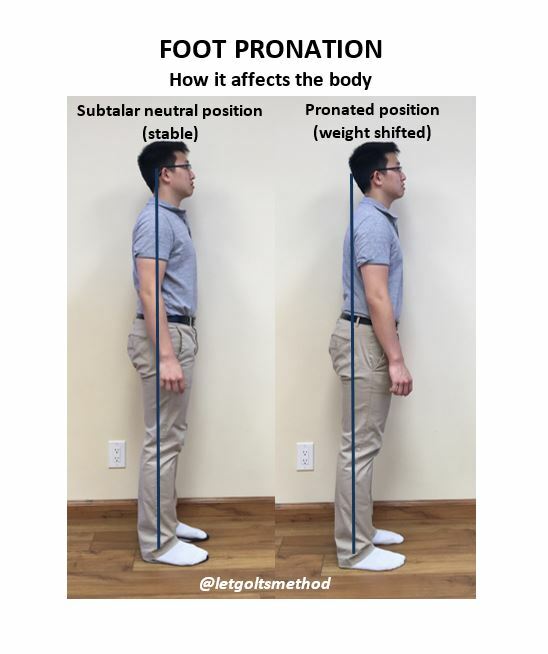 This chronic posture is why many people find it hard to simply sit or stand up “straight” and maintain that posture, as well as why many lower extremity injuries persist. It has nothing to do with how strong or weak the muscles are, but rather, with how their body compensates as a result of its structure – i.e., the bone structure of the foot having a bottom-up effect on areas higher up on the body.